What Your Barbecue Says About You? Are you an all-out, bigger-is-better barbecue chef, cooking for dozens? Or an understated, less-is-more type? Perhaps you prefer propane to hot coals? British Summer Time (BST) is taking its toll. Evenings are drawing out and the weather continues to improve, and long may it last. With that in mind, National Barbecue Week has descended upon us and as Brits, there’s nothing more we like to do than to cook with fire and fuel. Indeed, according to The National Barbecue Week statistics, three out of four households in the UK now own some type of barbecue grill*. Whether it’s using traditional charcoal or simple gas, there’s something about food which has been prepared al fresco on a barbecue, which makes the heart and taste buds alike, sing. But what does your barbecue say about you exactly? Are you an all-out, bigger-is-better barbecue chef, cooking for dozens? Or an understated, less-is-more type? Perhaps you prefer propane to hot coals? Whatever your preference, Robert Dyas has got just the barbecue for you, both online and in store. To help you find your perfect match, we’ve compiled a list of ‘Barbecuing Stereotypes’ to help get your barbecue season off to a sizzling start. A charcoal barbecue has always been the favourite of those who lean towards a purist approach when it comes to al fresco cooking. White hot coals, that distinctive smoky smell on a hot summer’s afternoon, not to mention the flavour only achieved using this traditional fuel. The Outback Full-Drum Charcoal BBQ with Quad Grill(£179.99) provides the perfect tool for creating your traditional barbecue and gives you plenty of cooking space, whether you are catering for few or many. The traditionalist likes to take time with their meal preparation and will always plan what items are fortunate enough to make it onto their grill. Precision personified. Just don’t attempt any third-party menu suggestions – for fear of scuppering your next chance of an invite! As the saying goes and, in this case, quite literally. The phrase doesn’t carry its definition lightly and it’s the same for those who prefer their barbecues with instant, efficient and adjustable heat. 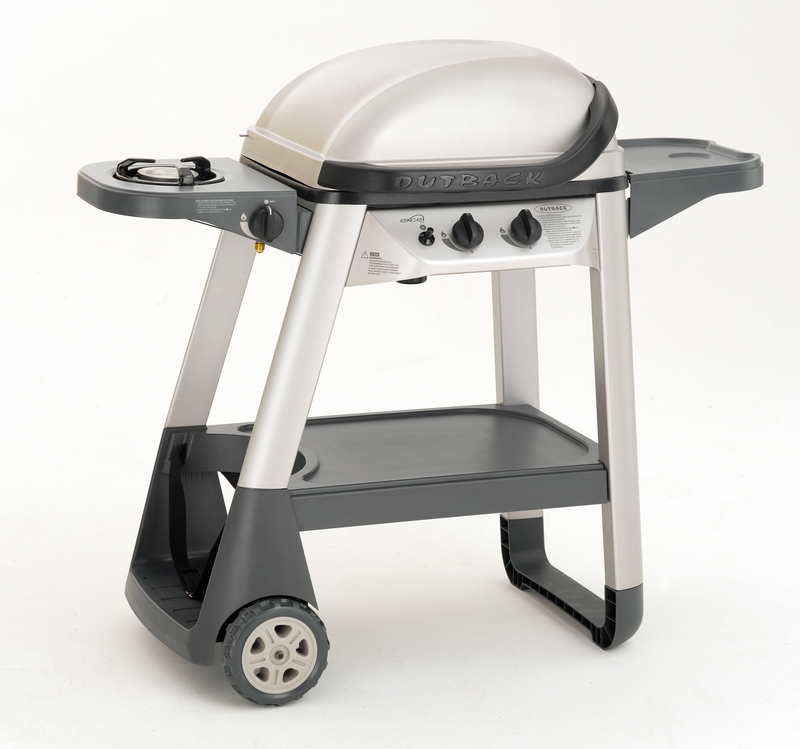 The all-in-one Outback Excel Gas BBQ Trolley (£139.99) is for cooking up a storm. 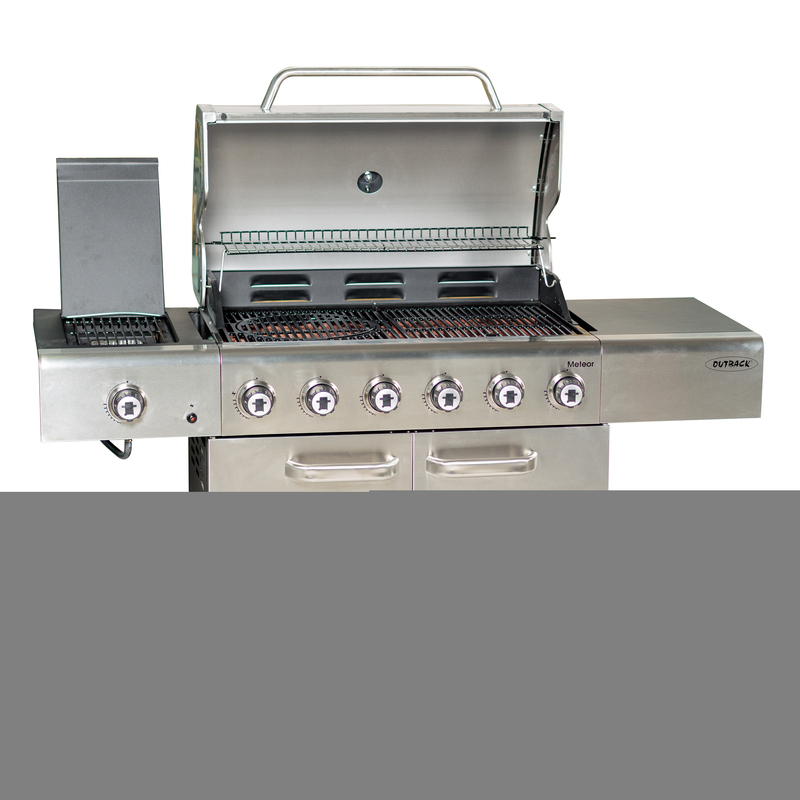 This easy-to-use gas barbecue has a large cooking platform, and an upper rack for cooking and storing extra food, perfect for when you are hosting larger parties. No waiting for coals to heat up, just turn on the propane and cook. The modern-day way of barbecuing and created for those who like to be in control of their food, whilst always having the opportunity to be spontaneous. Why choose one when you can have both? 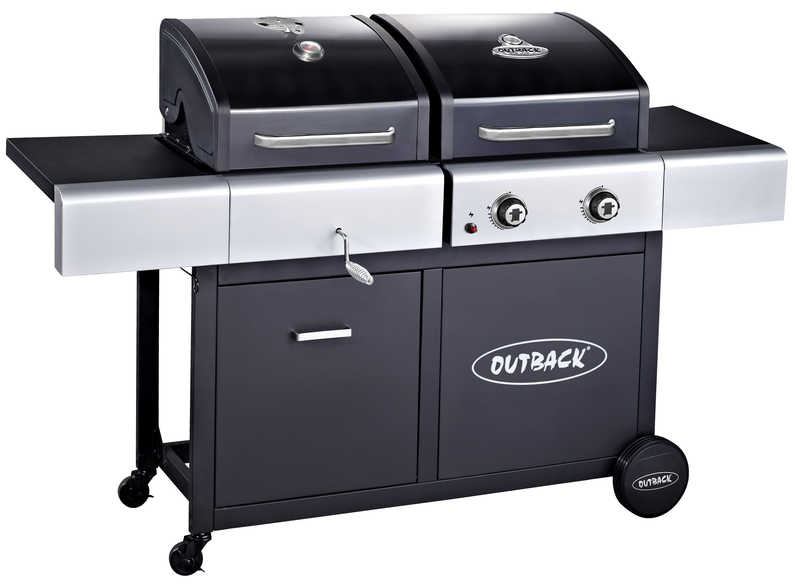 For the chef who likes to mix and match their cooking style, this Outback Dual-Fuel Gas and Charcoal Barbecue (£374.99) provides the perfect solution. 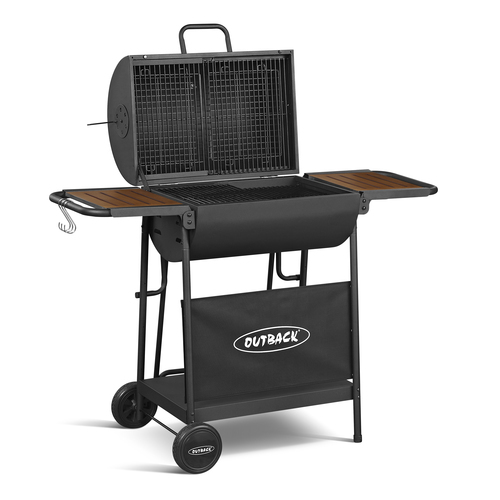 Featuring both gas and charcoal modes, this barbecue is perfect for both quick, spur of the moment dining or planned-ahead parties. Not only can it easily handle cooking up to 32 burgers at once, it has the addition of a pizza stone, giving you the best of both worlds and to suit everybody’s taste buds. The Jack of All Trades can’t be typecast, they are resourceful and flexible. Who says you can’t have it all? Bigger isn’t always better, especially when it comes to barbecues. Likewise, if you don’t have much outdoor space or are a frequent traveller, this Outback Voyager portable and smokeless charcoal barbecue (£79.99) makes cooking a breeze. Whether indoors, outdoors or on the road, this is the perfect companion for camping trips, intimate gatherings or chillier evenings when al fresco dining isn’t quite so appealing. Ideal candidates when the Great British weather isn’t on side. 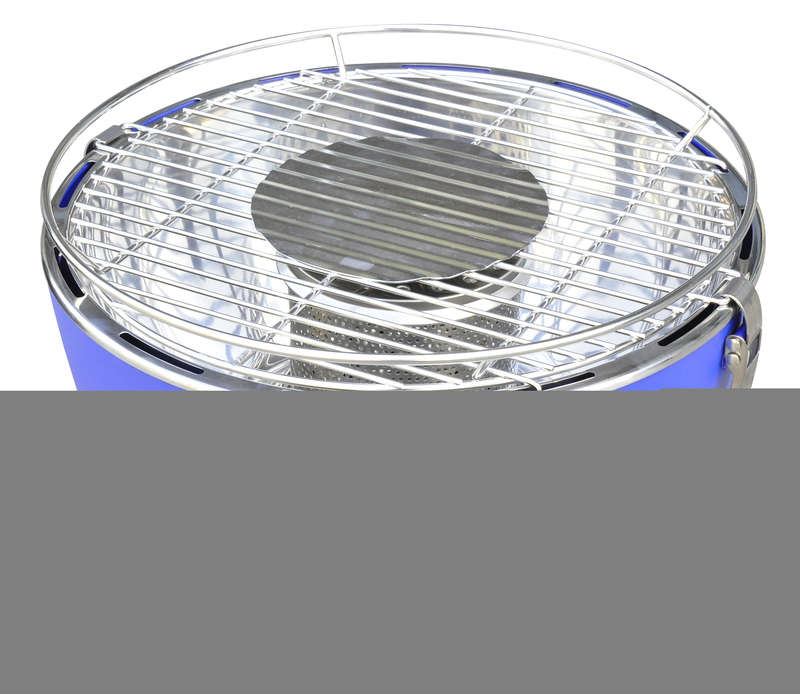 Compact, lightweight and smoke free, it provides the ideal barbecuing tool for those who don’t like to settle in one place. Small but mighty, with the ability to heat up in less than 15 minutes. Less is often more. For those who take their barbecues very seriously, there’s simply no better choice than an all-singing, all-dancing model, The Outback Meteor 6-Burner Gas BBQ with Multi Cook Plate System (£449.99). An aficionado of the barbecue, there’s nothing that a guru can’t take on and with this by your side, you won’t go far wrong. Featuring three interchangeable cooking surfaces within its large dimensions, including a griddle plate, grill and pizza stone, this offers versatility being gas, the ease to fire up whenever suits. In addition, it has a double storage cupboard for all your accessories. Why not add this 5 in 1 Barbecue Tool Set (£9.99) to ensure you have the best grasp of your food possible? Plus, for the winter months or just whilst it’s not being used, it’s worth investing in a barbecue cover to keep your beast in pristine order all year round. There is a wide selection to choose from to suit all shapes and sizes with the ideal barbecue cover. This is the barbecue to make a statement with, so what better excuse to invite everybody round for your finest culinary offerings. A Guru knows best after all. All prices correct at the time of distribution of this press release. Media Information provided by Famous Publicity. For further information, please contact Mary-Jane Rose at mary-jane@famouspublicity.com or Hetty Smyth at hetty@famouspublicity.com or Tina Fotherby at tina@famouspublcity.com or call the office on 0333 344 2341.